SOPA is THE issue in IP for early 2012. There is plenty of opposition to the bill from all sides but I’m left with so little confidence in Congress doing the right thing that I can’t forecast an optimistic outcome. 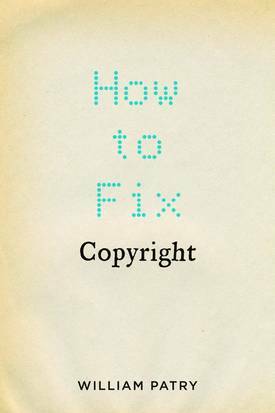 I’m tempted to mail a copy of William Patry’s new book “How to Fix Copyright” to all of my congressmen. I’m about halfway through and it carries a vital message that hopefully gets to our elected officials before SOPA is passed and does permanent damage to the Internet. The Jason Wu for Brizo Odin faucet is equipped with SmartTouchPlus(TM) Technology, which allows users to start and stop the flow of water with a simple touch anywhere on the spout or handle of the faucet. For a more intuitive experience, its hands-free mode activates the flow of water when hands are anywhere within 4″ of the faucet…an exclusive temperature control technology featuring a new temperature sensing indicator. A LED light display built into the base of the faucet uses shades of light, from blue to magenta to red, to indicate actual water temperature. The electronic valve built into the lavatory faucet also monitors the mixture of hot and cold water to help provide a consistent temperature for the user, while its high temperature limit stop offers an added degree of safety. This teamup is a nice reminder that collaborative trademark cross-licensing can be a win-win for all parties. If successful, the Jason Wu for Brizo collection will reinforce the position of the Brizo faucet brand as fashion forward and innovative, and it marks the debut of the popular Jason Wu into the world of interior design. Can you think of other innovative trademark cross-licensing efforts from Indiana companies? Leave a comment below.